Have been using Jolla since day 1, and despite claims that Pokemon Go should work on it with some workarounds, I struggle and can not get it to work. I've long time praised my jolla for its security (no datamining by android, no ads, it just works). There are faults (like lack of OIS for camera and laggy camera), but to this point I've been able to make compromise, there aren't many times I want take a picture, and a have phone around but not my ILC camera. For situations like that, a phone with superior camera would be nice (but like I said, doesn't happen often). The negatives are starting to build up though, so I will eventually look to buy android (sony or htc probably) or iphone, since the lack of good some apps + now pokemon is starting to hurt ..
Jolla user, 28 Dec 2013Jolla/Sailfish is first device/OS since iPhone/iOS with real new innovative userinterface (I d... moreyou dont count N9, a? and still you would like to own one you know it, so cut the crap. Time to update the review I guess. and app store is still there,and a unique User interface. and I thought BB10 had a steep learning curve, this OS is confusing as hell to use. The is is ok but not intuitive! Price shoukd be equal to asha! Anonymous, 23 Dec 2013As an old n900 user the only thing that interests me is the 'other half' thing, mainly because... moreI've been waiting for a slide keyboard as well... If they can deliver something like that, I can see it selling like fresh baked cookies. I have a Galaxy S3 and what i miss the most is a good slide keyboard. Something like Corby Pro. That would be my perfect phone! And like me, I know many people who are missing hard keyboards. If Jolla can deliver... please do it fast. nokia is microsoft,jolla is real nokia and MADE IN FINLAND! i felt like buying it but with that price.. no, thank you. Antonio, 24 Dec 2013I dont'like it very much. Also, we don't need another os, too much fragmentation, too many app... morefirst rule of "free market": competition is good. Read as: if someone can't hold it's leading position should and must go down... and be eaten by the survivals. Jolla user, 28 Dec 2013Jolla/Sailfish is first device/OS since iPhone/iOS with real new innovative userinterface (I d... moreWow. I love iOS, in fact it is almost the best and smoothest OS, BUT, let's not forget that while it introduced so many new UX things and gestures and all, the basic look is still the same. Grid of icons. You don't care to count Windows Phone 7 among those with a new innovative UI? Jolla/Sailfish is first device/OS since iPhone/iOS with real new innovative userinterface (I don't count n9, because it wasn't supported by its manufacturer, it was DOA product). 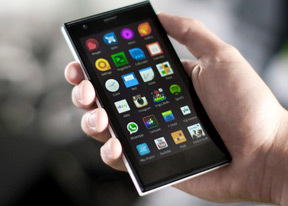 Like original iPhone, Jolla lacks features. 4G and navigation are on the way. Android support handles special software needs. My main concern is about basic applications. Does Jolla has enough resources for creating competitive sw. Current calendar and browser are very basic ones. I hope Jolla will get deals for example with Mozilla or other to help them. Native firefox would be nice! Anonymous, 25 Dec 2013"NSA Free" but has the Yandex store, which is pretty much run by the Russian government.Google Play run by the USA government? Jolla is just very promising. It's still a beta version, but the OS looks so nice. I hope they will sell enough phones to make another investment in the OS and maybe an even better phone. I will buy this phone next year I think, it looks very nice and promising. Hope they can keep a regular schedule of updates to improve the OS step by step. It's a company I would trust with what they say. Keep on going Jolla. Jolla took the opportunity of continuing the beauty of N900~N9. I will be eagerly looking for Jolla's success story with Sailfish, so that Nokia can repentant. though I'm not Nokia fans, but I hope to see Jolla success. Nokia already sold their soul to the devil, hope Jolla can keep the spirit of the true Nokia.